'The Lemonade Stand Clips' is a citric set which contains 65 digital goods. 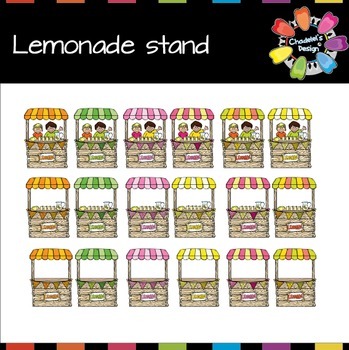 As its name indicates, this set turns around a lemonade stand, so it includes lemons, lemonade jugs, halves of lemons, lemonade glasses... etc. If you like lemons, this is your set! 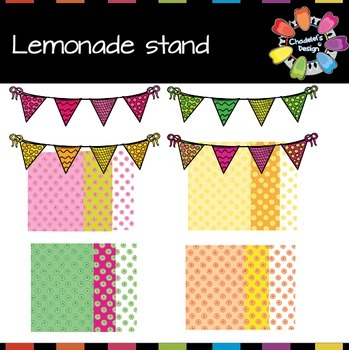 - x7 Lemonade Stands: B&W, yellow-green-orange, pink-yellow, tones of yellow, tones of pink, tones of green and tones of orange. 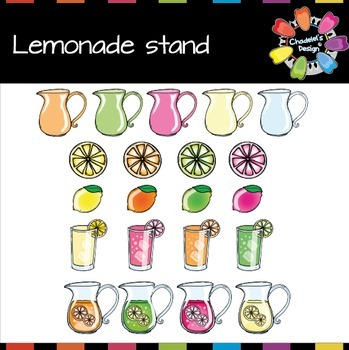 - x7 Lemonade Stands with lemonade jugs and glasses: B&W, yellow-green-orange, pink-yellow, tones of yellow, tones of pink, tones of green and tones of orange. 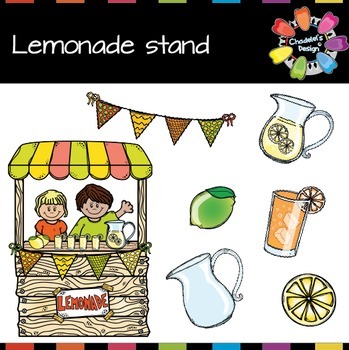 - x7 Lemonade Stands with kids: B&W, yellow-green-orange, pink-yellow, tones of yellow, tones of pink, tones of green and tones of orange. - x6 Empty jugs: B&W, blue, yellow, pink, green and orange. - x5 Jugs with lemonade: B&W, yellow, pink, green and orange. - x5 Glasses with lemonade: B&W, yellow, pink, green and orange. - x5 Halves of lemons: B&W, yellow, pink, green and orange. - x5 Lemons: B&W, yellow, pink, green and orange. - x6 Pennants: B&W, orange-green, pink-yellow green, orange-yellow, yellow green-green and pink-magenta. Take a look to the preview images but remember that they are not in High Quality but Medium Quality. This set has been created in PNG format and in High Quality (300 ppp in Adobe Illustrator CC7). Thanks to this format, you can print all the digital images out in high quality for educational purposes basically. You can also create logos with these digital goods adding some text. If you are going to use these cliparts in a commercial way, you must add some text first and then, give me some credits to my TpT Store with a link or with the Chadelel's Button that is included in the file. Your works have to be in a POSTER format or PDF in order to avoid transferring to other people due to copyright reasons. You can use these cliparts for logo websites, but you must give my TpT Store credits too. My digital goods need some text for selling or sharing. POWERPOINTS USE > If you are going to share or sell a powerpoint in other websites, you must add a specific note about the copyright of the images and give credits to my TpT Store. I usually share with teachers who teach English in other countries my classroom resources. You can take a look if you are interested in. What's more, you can see the way I use my images on my worksheets, posters, flashcards and games. The Facebook page is English4Every1 - Chadelel.